The Illinois state slogan is “The Land of Lincoln” and while we were in Southern Illinois in September, we found this to be true because we were confronted with a bit of his history completely by chance. While heading up to Great Cities State Park in Makanda, we found one of the three sites for the Alexander County Courthouse where Lincoln practiced law. As you probably already know, I am obsessed with county courthouses and am determined to visit every county in the United States. This can be an issue sometimes when we are on the road towards our destination, but I am lucky to have a husband who enjoys the thrill of a good travel hunt and, in this case, encouraged me to go find one. On Illinois State Route 3 we found a roadside park with a large historical marker. We do not often stop to read the historical markers, but thankfully we did in this case. 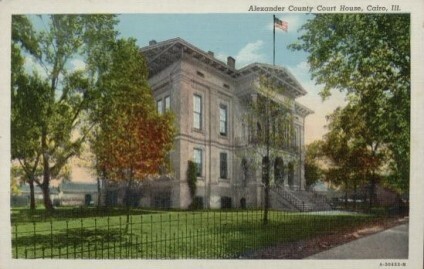 We found the Alexandra County Courthouse once resided in Thebes, just a mile or two back from where we turned on to Route 3. Since this was what I like to term “encouragement from serendipity,” we turned around and drove to the once bustling village to find a tiny community quietly living along the Mississippi River. Driving up to the shoreline, we were pleasantly surprised with a view that was breathtaking. Here we stood in the shadow of the Thebes Bridge crossing over the great river as it had done since it’s opening on April 18, 1905. As I am looking at this bridge and in awe of its presence, Scott points to a building high on the bluff behind us and says, “Now that house has one of the best views around here!” I had to agree with him and found myself a bit jealous of whoever was lucky enough to own the building. The views over the past 170 years have probably been extremely impressive and I couldn’t wait to get up there to see the view; at least I hoped we would be able to see a view from there. Having the GPS in front of him, Scott drove to where it showed the building and we were stunned to find an extremely steep road that was not one for the faint of heart. (Keep in mind I was not the one driving; also keep in mind, I am a terrible passenger.) He made the turn into what we thought was going to be a drive way to a privately-owned home, only to find a public, historical building; we had found the former Alexander County Courthouse. 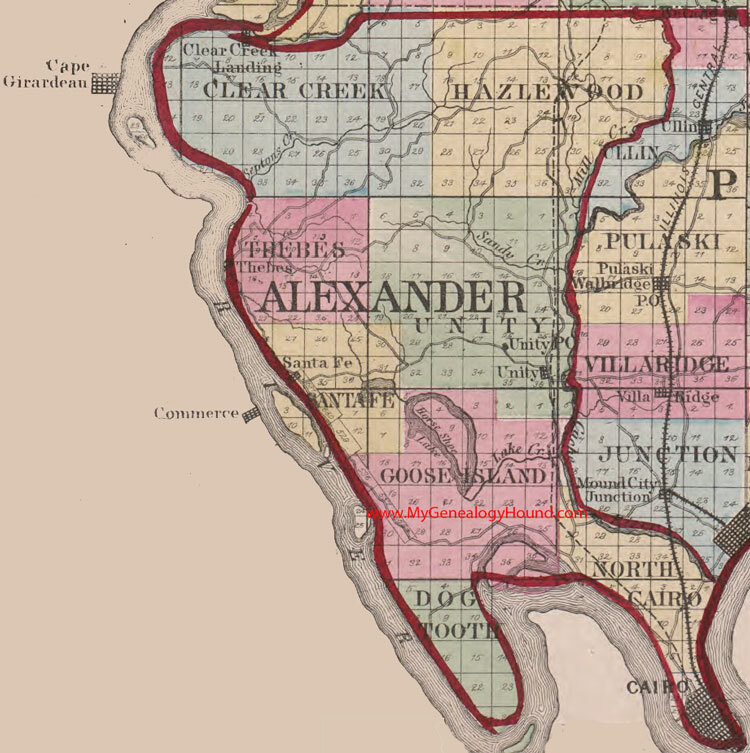 Alexander County which was created out of Union County in 1819; it was named after early settler and physician William Alexander of America, Illinois. He became the Speaker of the House of Illinois Representatives in 1822, making this the county seat of the new county. However, soon after, the village of America was found to be in the newer Pulaski County, causing the Alexander County Courthouse needing to be moved to Unity, Illinois, in 1833. In 1842 the courthouse and county records were burned, therefore, moving the county seat to Thebes. An architect named Henry Ernst Barkhausen came to America in 1835 and settled near Thebes where he operated a woodyard and ferry across the Mississippi to Missouri. In 1845 he was contracted to build the two-story structure out of local stone and trees from the area. The land, a bluff overlooking the Mississippi River, was donated by George and Martha Sparhawk. Completed in 1848, the total cost of the construction was $4,400. As we wandered about the amazing building, we found there was actually a fantastic view both of the Mississippi River and the 170-year-old structure. I was pleased to see the natural stone and that my hand embroidery piece portraying a stone wall looked much the same. It always amazes me when art takes on a bit of nature, it helps to preserve the beauty we find around us daily. 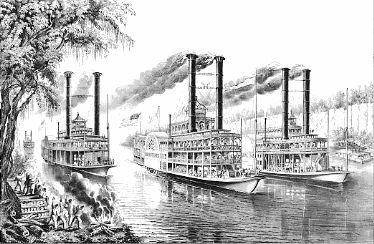 Sitting on the wooden stairs, looking out at the massive body of rushing water while the barges passed under the massive iron Thebes Bridge, I could envision the steamboats of the past making their way while transporting people and cargo to various ports along the Big Muddy. These large ships were moved by large paddles powered by steam and it was the main source of travel along the river. Here you would find people of many statuses from the Southern Belle to the gambler to the slaves and you would find the cargo hold to be full of cotton, grains, and everything a river settler might need to survive. These machines revolutionized travel and life along the shores of the Mississippi River Basin. The steamboat was the main source of travel in this area from the late 1700’s until around the 1880’s. People used this mode of transportation for business, personal travel and for entertainment. You could find a showboat paddling up and down the Mississippi River; these boats were floating palaces with every type of luxury found at popular resorts of the era. It was a slow mode of travel and that was the cause of its demise. With the railroad being unified so all of the rails from the North and South were the same, the speed of transport was much better for travel and the moving of items. Granted the steamboats were still in use until the 1940’s, but they were not used like they had been. It was the end of an era and culture. Coming out of my time travel trance, Scott and I moved on towards our state park destination of Giant City State Park just north of Jonesboro, Illinois. As we drove through the Trail of Tears State Forest (actually within the Shawnee National Forest), Scott realized we were going to be passing through the town where where a pivotal moment in Lincoln’s political career happened on September 15, 1958. Before the Great Debate of 1958, Lincoln was just a regular man trying to get through life working as a boatman, store clerk, surveyor, militia soldier and lawyer, but in 1834 he was elected to be in the Illinois Legislature. From there he moved through the political arena, as most do, and found himself in a political fight for a seat in the House of Representatives for Illinois. Which brought him to the Great Debate of 1958, more importantly Jonesboro, Illinois, September 15. The Lincoln-Douglas Debates of 1958 were a series of debates between Abraham Lincoln and Stephen A. Douglas in Illinois, a free state. The main theme of these seven debates was the expansion of slavery in the new and future territories of the United States. Granted, Lincoln lost the seat he was trying for, but he later had the transcripts from these seven debates causing him to open a door of opportunity for him to receive the nomination as the Republican candidate for the 1860 presidency. Eventually, we arrived at one of my favorite places, Great City State Park. We had originally thought about using this site for our viewing of the total eclipse on our trip in August. Makanda, the town just outside of the park, was the location where the eclipse would happen for the longest period of time. However, because rain was predicted that day in that area, we chose to visit Indian Cave State Park in Nebraska instead. Unfortunately, we were not able to see the eclipse due to rain, while Makanda, Illinois, was basking in the eclipse they counting on. As we were driving down the road, passing the Jonesboro area, a thought came to mind, “Whatever happened to the Alexander County Courthouse? Where did it go if it were not in Thebes?” I, being in the passenger seat, began to hunt through the interwebs to find the answer. It was relocated to Cairo, Illinois; just down river from Thebes. 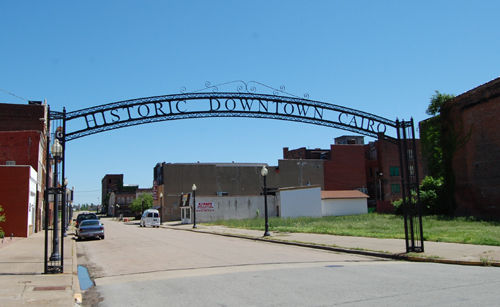 With this information, Scott drove us to Cairo to find where the county seat had been moved. There we found a city in shambles and an old downtown almost a ghost town. Cairo sits just North of the the Mississippi and Ohio Rivers confluence, a point called Fort Defiance State Park. This city, once a bustling port town, was home to writers, generals and gods. 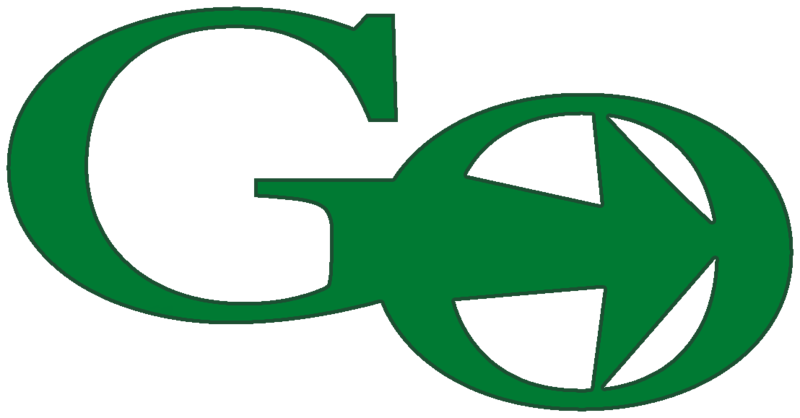 It is the location of Neil Gaiman’s award winning novel American Gods, the movie Cairo Time, and documentary Between Two Rivers. No matter how “famous” these media outlets make the name of the city, it is a city in economic decline because the railroad impacting the barge traffic causing the loss of income, the interstate bypass causing people to go around the city, and people leaving the area to shop causing tax dollars to go elsewhere. Because of this situation, the area has dilapidated buildings, loss of tourist money, and a community left frustrated. I cannot, however, leave you thinking this city is not worth visiting because this would not be truth. Your first impression of this place is a city that is dying; but if you will stop and speak to members of this community, you will find people who are doing their best to rebuild by cleaning up their communities, encouraging the arts, and helping each other out as much as possible. I find myself rooting for this place and her people because there is such a determination. Here will you not only find the determination, but you will find a people who know their history and are encouraging the use of it to bring in tourism. They have the Victorian building such as the library, federal building, and private homes, but what about the Alexander County Courthouse? In 1859 the courthouse was moved to Cairo and it was housed in a beautiful building, after the completion in 1865. After contacting the county courthouse, I found that sometime before 1963 the building above was destroyed by fire and had to be demolished for safety issues. The building of the new courthouse was started in 1964 in the same location as the first building. This is one of the things Scott and I have found with many of the old county courthouse buildings that are now of a modern designed; rarely are they because the citizens wanted something modern. However, has seemed to happen in a few cases. Concerning this county, it was fire and so the citizens of Alexander County decided they needed to move forward. Thebes was already the county seat, but Cairo was growing rapidly and thought it should be moved there. Tempers were flaring and the Thebians said that Cairo was no more than a daub of mud on the tail of the state. That statement did not set well with the fine citizens of Cairo. Just before the election was held to decide the location of the county seat, a Cairo man came up with an inspired scheme. He fetched a green animal hide and stuffed a large boulder inside. He tied this bundle behind his mule and drug it around the countryside. The next day he made sure that the townsfolk of Thebes made notice of the strange marks on the ground. He suggested that the marks were made by some species of large serpent. Rumors were spread that dogs, cats and small farm animals were missing.